I used to love a cheese and onion pasty from Greggs (the bakers). I think I’ve managed to create a pretty decent vegan alternative, although I have named my version a “slice” so that my friend from Plymouth doesn’t beat me up. 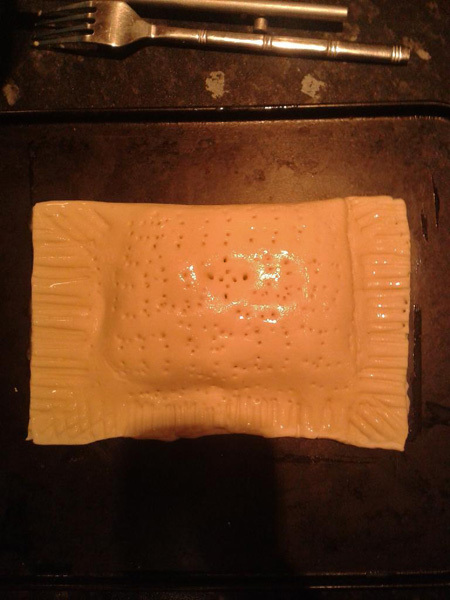 Apparently a pasty has to be pasty shaped, NOT a rectangle. Also, a pasty should be made from short-crust pastry… so “slices” it is! The majority of what I eat is created from scratch. 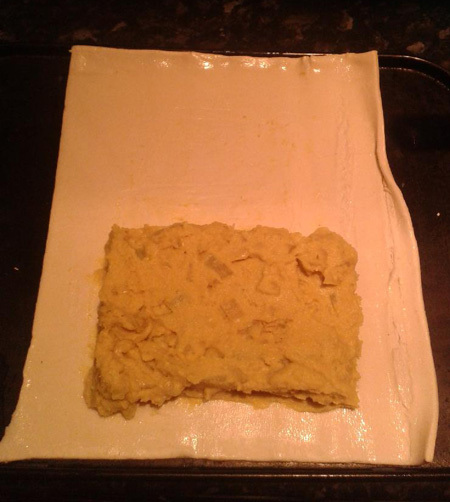 However when it comes to puff pastry, I can’t see the point in wasting all that effort and energy when you can just buy a packet of “JusRol”: http://www.jusrol.co.uk/ProductDetail.aspx?ProductId=6 It’s tasty, fast and vegan friendly. Not to mention fool proof! In a medium pan, add cold water, the stock cube and potato. Turn on the heat and when the potato just starts to go soft, add the cauliflower. Cook until everything is tender, strain and add to a food processor along with the milk. Blend until you have a smooth puree. Add the mustard, yeast flakes, nutmeg, turmeric, salt, garlic powder and pepper and blend some more. Finely dice the onion and fry in a little bit of oil until translucent. Add to the potato-cauli mixture and stir in by hand. Un-roll out the pastry so it is flat on your work surface. Cut into equal halves. Imagine a line down the centre of each pastry half. Spoon half the filling onto one side of each pastry half, leaving a clean edge on three sides (refer to picture if that makes no sense!). Brush the clean edges with a little milk. Fold the filling-less side of the pastry over the filled side and press the edges together with the back of a fork. Brush each slice with a little milk and put into the oven for 15 minutes or until golden brown. 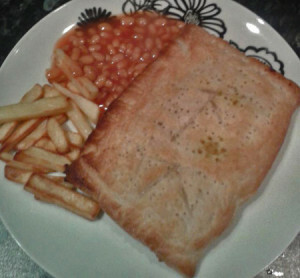 It’s Saturday night and I wanted a treat so I served our slices up with chips and beans rather than my usual multi-veg combo. I am secretly chuckling to myself because my Besty will be HEAVING when she sees this photo – she hates beans with a passion, heh heh heh!